Wild days skiing, wild nights out on the town you will probably end up doing both in legendary Chamonix. One of the world’s oldest ski resorts and incredibly popular throughout the year with climbers, boarders and skiers, all drawn to Europe's highest mountain and spectacular views. The favourite runs in the area are Le Brevent, Vallée-Blanche, and the Grands Montets. 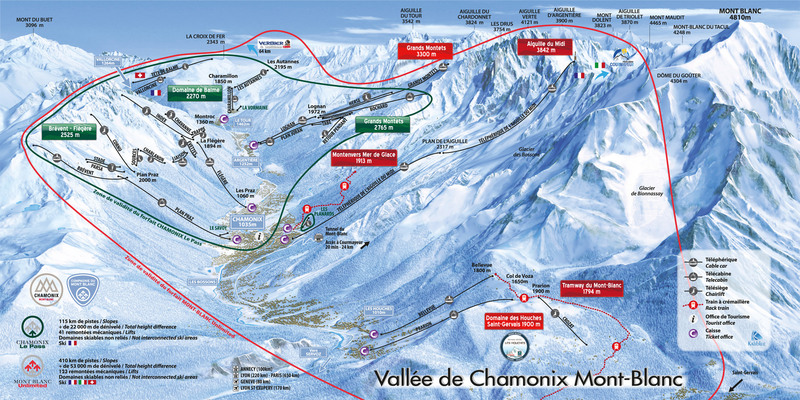 Chamonix is known for its fantastic off-trail skiing and snowboarding opportunities, as well. Including the off-trail slopes, the area offers up to 30,000 acres of skiable terrain. There are 145 trails weaving throughout the area adding up to 140 kilometers (87.5 miles). The favorite runs in the area are Le Brevent, Vallée-Blanche, and the Grands Montets. Chamonix is known for its fantastic off-trail skiing and snowboarding opportunities, as well. Including the off-trail slopes, the area offers up to 30,000 acres of skiable terrain. Geneva Airport- 1hour 15minutes Apprx. Champery Airport - 1hour 30minutes Apprx. Lyon International Airport - 2 hours 15 minutes Apprx. We've partnered with Ongosa, who recommend and book the best snowsports instructors and guides in Chamonix for you. The most popular ski passes are the 6 day Mont Blanc Unlimited ones, which are suitable for most visitors to Chamonix. Cape Horn- Between Fench cuisine, the flavors of Japan, and the international influences of their Chef de Cuisine. Big Horn Bistro - bringing you a modern take on American inspired cuisine in a friendly and relaxed atmosphere. Bizes - Those with pure food indulgence in mind will find their menus irresistible. Mouth watering recipes inspired by local and international people. Chamonix is one of the world’s most famous ski destinations and you will be amazed by the après ski atmosphere in resort, thanks to the best après ski bars in Chamonix! Many venues will have a real party atmosphere with live music or DJs. It doesn’t matter if you’re with friends or family you are sure to find an après ski bar to suit everyone in your group whether you’re still in your ski gear or already dressed up for a night out on the town. Here are some of the top Apres ski places to be! Chamonix has an international reputation as the home of skiing and adventure sports all the year round although best suited to expert and immediate enthusiast skiers. If Skiing is not your fancy then Mountaineers can tackle the mighty Mont Blanc or the many routes around the massif. The Chamonix valley is also a haven for rock climbers with everything from bolted sports routes in the valley to trad climbing at mid-mountain level, plus numerous bouldering opportunities. There are trails for mountain bikers and road cyclists to enjoy and be challenged. Paragliders fill the sky in both summer and winter giving visitors a unique view of the valley and the skiing activity below. Several major sporting races take place each year in Chamonix, open to (athletically trained) eventers. They include mountain/trail running marathons, ultra-trails, triathlons and cycling races. 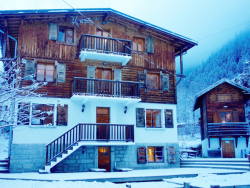 [short_description] => Tradition catered chalet for either a short break or  week stays ,sole use or shared. Ski shuttle service to slopes  a short walk to town center. Tradition catered chalet for either a short break or week stays ,sole use or shared. Ski shuttle service to slopes a short walk to town center. [luxury_short_description] => The accommodation covers 2 floors with 3 double bedrooms and a double with 2 bunk beds overhead. All the bedrooms have private en suite bathrooms. The accommodation covers 2 floors with 3 double bedrooms and a double with 2 bunk beds overhead. All the bedrooms have private en suite bathrooms. 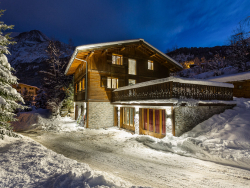 [short_description] => The largest chalet in the town centre of Chamonix which can accommodate up to 22 guests with 11 twin bedrooms, 10 bathrooms and hot tub. 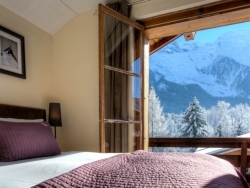 The largest chalet in the town centre of Chamonix which can accommodate up to 22 guests with 11 twin bedrooms, 10 bathrooms and hot tub.